Trout fishery biologists & consultants for trout ponds, farm pond, stream, lake construction & pond management, designing & building trophy trout pond, fishing pond, lake & stream habitat.We design trout ponds & farm ponds for building in Canada & the U.S. Trout thrive in our trout pond and lake designs. California colorado maine vermont new hampshire pennsylvania north carolina montana minnesota & indiana. building fish ponds. Join our Biologists in Scotland next May for an epic fishing adventure for arctic char deep in the Cairngorms Wilderness and Atlantic salmon from the luxury of one of Scotland's most romantic Castles. Biologists' pond building techniques stand out. When you look at other ponds then see a Spring Creek design pond, you'll know it. Our pond construction / or trout pond construction ability has been fine tuned for over 30 years. Trout pond & Trout Lake construction goes beyond engineering; it takes fishery biologists & aquatic consultants. Washington fish ponds & california farm ponds to idaho farm ponds, also maine fish ponds. building fishing ponds or a fishing pond. Pond management plus Pond management tips & help. is a very precious resource. Lakes, ponds and streams bring great financial and emotional value to land. 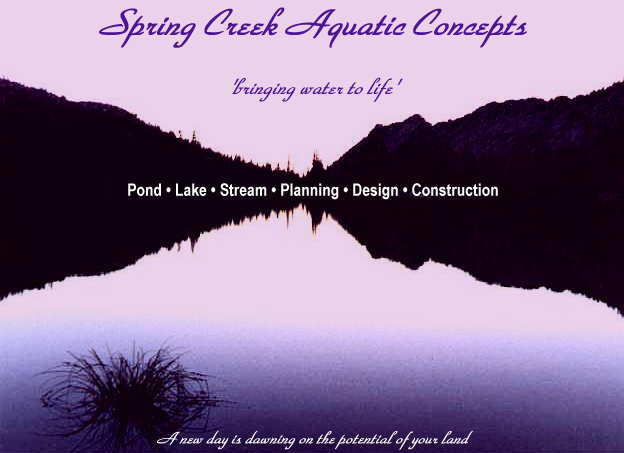 Spring Creek Aquatic Concepts specializes in creating the finest lakes, ponds, streams and shorelines. We design aquatic habitats from the bottom of the pond to the upper edge of the wetland shoreline. Whether a simple backyard pond, a private fly fishing lake, stream shoreline, or a large lake of several hundred acres, our innovative practical approach will add the greatest value to your property. We have an expert staff and affiliates to plan, design, and create just the pond, lake, or stream environment you desire. We assist you using several methods: a remote consultation, a site visit, or a complete project design. We can coach you through the process, or take the reins for a complete project. Proper design brings numerous benefits such as larger fish, less sediment, proper temperature, clearer water, greatly reduced maintenance expense, a much more natural appearing environment and much greater property value. There is an entire industry devoted to maintaining lakes and ponds. Most of this industry is generated from habitats with less than ideal design and construction. Investing in proper habitat design, results in considerable savings of money, efforts, and risk over the life of the lake or stream. We also redesign existing habitats to achieve the same benefits we offer to new construction. Building ponds and lakes with our professional assistance actually cost less to build and maintain than those built without our help. The habitat quality we provide greatly improves the value your investment. We assist many "do it yourself" people in their quest for an aquatic environment. We repeatedly hear "I wish I would have met you people when I first built this lake. You would have saved me so much money and effort." Then we begin the costly process of repairing what they have worked so hard to build. They continue to say "I read all the books." Books are a good place to begin, but rarely go into sufficient detail to create a high quality habitat for each site's unique combination of circumstances. An entire library and decades of experience are necessary to accomplish these goals. Occasionally nature creates what we view as a perfect pond, lake or stream. We study these very closely. After identifying missing elements in your habitat, we then compensate for the discrepancies. The results are habitats of surprising quality. We possess the ability to improve the biology, geology, chemistry, physics and geography of your habitat. The only challenge we have yet to surmount is how to get the sun to shine more often. EXPERIENCE COUNTS. With over twenty-five years of experience, not only in scientific pursuits, but in the practical application of construction, we provide the technical and practical expertise to do the job correctly the first time. Because of our practical experience, we have been selected to design a lake on land owned by the aquatic biologist responsible for one of the largest pristine mountain lakes in the United States: Crater Lake in Oregon. Our projects over time have run from developing indoor trout habitats in living rooms (without the aid of refrigerated water) up to analysis of watersheds of several hundred thousand acres. We have a great deal of experience pushing the limits of temperature tolerance in cold water fish such as trout. If you doubt trout can survive in your location, there is a good chance we can still make trout habitat of it for you. Knowledge of habitat by itself is not sufficient for the best lake and pond designs. We have worked with a wide range of trout and salmon, many of which are threatened and endangered. Aquatic habitat design and fish stocks are matched in order to ensure the success of your project. WHAT HAVE WE DONE LATELY? Currently, we are working on projects as diverse as reclaiming urban wetland habitat, to developing golf course water hazards into healthy trout habitats. Just imagine trying to concentrate on your golf game on that course. This is in addition to our usual lake and stream projects. Starting with the clients' vision of the perfect lake, we blend in our experience and techniques to reach goals far exceeding expectations. We can start by adding a beach or a rock outcrop, then mixing in floral meadows and streams for trout to spawn or large enough to fish or even float with a canoe. These visions merge to produce the perfect pond or lake for the ultimate water recreation venue and mecca for relaxation. We have an outline for your use to plan and carry out your project with as much or little assistance as you require. Read our PLANNING GUIDE to help develop the best possible lake or pond. Read through the TECHNICAL FAQs page for more specific answers to your questions. IN THE NEWS: Our Senior Fishery Biologist was the Technical Advisor for an important new trophy trout fishing book titled: Big Trout. This book will not only change the way you think of chasing trophy fish, it will cause you to replace those old photos of trophy trout with new photos of even bigger trout. Biologists pond design from landscape pond design to recreational pond design and trophy fishing pond design. north america pond design advice and tips. The best pond design professionals or pond designers are Aquatic Biologists who understand pond design well beyond the simple popularized concepts. Large pond design by Biologists yields a much more efficient and natural pond habitat. Natural pond design is always best performed by Aquatic Biologists. The best Pond Design and designers are Aquatic Biologists. Other pond designers have demonstrated rudimentary understanding of pond ecology let alone lake ecology. You can see who the best Pond Designers are by comparing what you see with a completely natural pond. There is a lot of abuse of the definition of natural ponds tips for Building natural ponds requires much more knowledge than plastic lined non natural waterfeatures. farm pond design and fishing enhancement is another area in which we consult. some of the most natural waters are farm ponds which have numerous challenges from siltation to water quality and weed control. farm pond construction by nature is complex due to water supply quantity, nutrient runoff and water quality issues including low oxygen concentrations, acid and basic water. Sealing agriculture and farm lakes with bentonite clay helps water quality. Irrigation and trophy cold water and warm water fishing ponds are the top goals for farm ponds on agriculture lands property and real estate. find us on facebook or google plus to see our full ponds image gallery for clear water, native fish like brook, rainbow and cutthroat and other warm water fishes like bass and bluegill, catfish, but no carp or invasive fish. Pond Construction by Biologists: designs for natural pond construction and large pond construction. Biologists make the best pond construction consultants & advisors because we understand the science to build fish pond construction and design process to create natural pond habitat. Small to large pond construction projects become much more cost effective. Pond construction tips help and assistance Large pond construction experts and Biologists use much more cost effective techniques via their technical and professional knowledge. Constructing a pond with Aquatic Biologists help is much more effective than constructing a pond with a landscape architect or designer. Large pond Constructing a pond with Biologists yields a much more natural habitat. Large pond construction exposes the real knowledge of the pond designer and their understanding of natural habitat. our Ponds and Lakes and Ponds defines the difference between ponds and lakes. Building a pond with a Biologist gives you a pond that's completely natural instead of building a pond that looks artificial with rocks and barkdust mulch around the pond. If you are building a pond, why not make it natural. Building a natural pond. Why undertake building a pond if it does not look natural and function naturally? natural habitat has a certain emotional feel. Building a natural pond is much more complex than the usual landscape pond. Building a plastic lined pond does not produce a natural pond. Has anyone seen a plastic lined natural pond ever? If you want to build a natural pond then follow how natural ponds are built in the nature. Building a natural pond requires much more knowledge and yields much greater rewards. Trophy Trout Biologists who design natural Trophy Trout Habitat without artificial "Trophy Trout" from Trout hatcheries . Trophy Trout Lakes design & development by Fishery Biologists. Trophy trout habitat design by Biologists at Spring Creek provide the best trophy trout habitat in natural ponds and lakes. Trout habitat design is very demanding and best performed by Fishery Biologists who specialize in trout habitat. Clear water habitat is even more demanding to produce large trout that naturally spawn and reproduce in trout ponds . Clear water trout habitat for rainbow trout habitat , brook trout habitat , brown trout, lake trout and cutthroat trout habitat. Small or large trout habitat can be produced at various investment levels from backyard trout habitat to large trophy trout lake habitat designed by Biologists. Building a pond habitat with a Biologist gives you a pond habitat that's completely natural instead of building a pond habitat that looks artificial with rocks and mulch around the pond. do you see these in natural pond habitats? If you are building a pond habitat , why not make it natural. The most natural pond habitats are designed and build projects by Biologists. We work with natural habitats every day. A well designed waterscape is a complete habitat and not just a "plastic pond with a filter". Waterscapes are not "balanced" when additives such as commercial supplemental bacteria are required. Pond design from fish pond design to trophy fishing pond design by Biologists. Pond design advice and tips. Natural pond design is the basis of our work as professional Biologists. Pond design isn't something one learns from books. Pond design books are woefully inadequate for such a complex science. The best pond designs come from years in the field making observations. Our pond design knowledge transcend any published books. Pond Building design from pond building Biologists experienced in building natural self maintaining ponds. Our pond building methods are derived from 20+ years of pond building experience by pond building Biologists / professionals and not engineers. Natural pond building by Biologists is the best way to build a completely natural pond habitat. No one understands the ecology of a natural habitat as well as Aquatic Biologists. subjects: fishing ponds and fishing pond management & design. earthen pond construction with clay pond construction methods. mud or clay pond construction. Fishing pond building design is best undertaken by profesional pond building Biologists. We have the best design understanding via science and our knowledge as Biolgists. The best fishing pond builders will also be Biologists. Building a pond using natural methods to build a pond with Biologists. building fish ponds large pond or large pond building. Create your pond with Biologists who excel in building large ponds & trophy fishing large ponds. dirt pond construction. Building earthen ponds plus earthen pond building methods. building dirt ponds. Lining a pond with clay for building clay ponds . Clay pond lining using bentonite pond liner or natural clay pond liner. Biologists clay pond liner tips. lining a pond with bentonite clay. Helps with a clay lined pond and clay lined ponds. Earthen lined ponds and pond liners including most pond liners of clay. ponds liners digging ponds. Instructions for digging a pond and pond digging help. Tips for sealing a pond inculding sealing a pond with clay and help with sealing a pond with bentonite clay. Sealing a pond with bentonite clay. How to seal a pond specifically how to seal a pond with clay especially to seal a pond with bentonite. Farmpond construction Biologists. Building a farmpond or Building farmponds. Swimming ponds. Swimming pond designs for building swimming ponds. Swimming pond construction, help with Digging a swimming pond. Tips to build a swimming pond, a swim pond or swim ponds. swimming pond design. trophy fish pond design. Natural Pond liners & selecting Pond liners, the how to's of Building a pond without synthetic pond liners to utilize inexpensive pond liners. Types of pond liners. Synthetic pond liner prices versus clay pond liner prices. Pond lining and Lining a pond economically. pond linings. How to line a pond. how to keep a pond from leaking. lining a pond economically. leaky ponds. Lake Construction: Biological Design for Lake Construction. How to build a lake. Biologists - consultants to build a lake habitat. specialize in Lake Building.